You may also hear this site referred to as the Odeon of Herodes Atticus, and you will find it on near the rock of Acropolis on the southwest side. It is an ancient theatre that is able to seat 5000 people. Back in the day, the theatre had a wood roof and wooden coverings to help protect people from the weather, and to help the sound travel a little better. Some of the theatre and most of the monuments were destroyed by the Heruli tribe in 267AD. 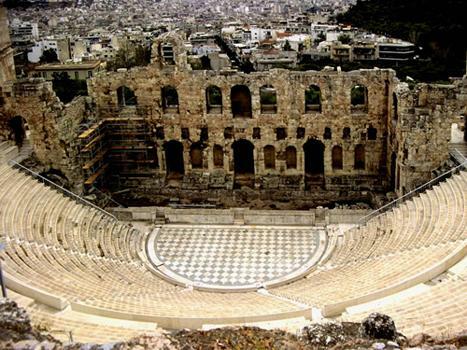 You may take the Athens metro and get off a that Akropolis station, where you are able to make your way to the south east side of the Acropolis rock to find the theatre. There are almost 30 bus routes that stop near the theatre, and there are three trolley routes that stop nearby. If you are going by foot, then starting at Syntagma Square, you need to walk up Filellinon Street all the way until you get to Vasilissis Amalias Avenue. Walk up the avenue until you get to the walkway of Dionysiou Aeropagitou. Continue and follow it until you are able to see the Odeon of Herodes Atticus on your right hand side just below the Acropolis Hill. In summer, the hours on Monday are from 11:00, not 08:00, and it is frequently closed on Mondays in winter. If you have, or are going to, visit the Acropolis, you can get a great view of the Herodes Atticus theatre as you look down from the Acropolis rock. They hold outdoor concerts and movie shows within the Theatre, and they have altered the seating a little so you are able to sit and watch more easily because the original rock had worn away quite dramatically. Note that taking photos and/or video is not allowed during performances, so do it secretly or near the end when it is too late to throw you out. You are allowed to take photos and videos when there is not a performance or movie show taking place. Due to the fact there are performances there and lot of equipment laying around, there are times when you are unable to visit unless you are seeing a concert. This means there is a chance you will only be able to walk up to the entrance on some days. However, do not be disheartened, as the Acropolis rock offers plenty of spectacular views of the Odeon.